So somewhere this afternoon I piled everything from the floor and closet onto my bed and then did what any rational gal would do: headed to Target. 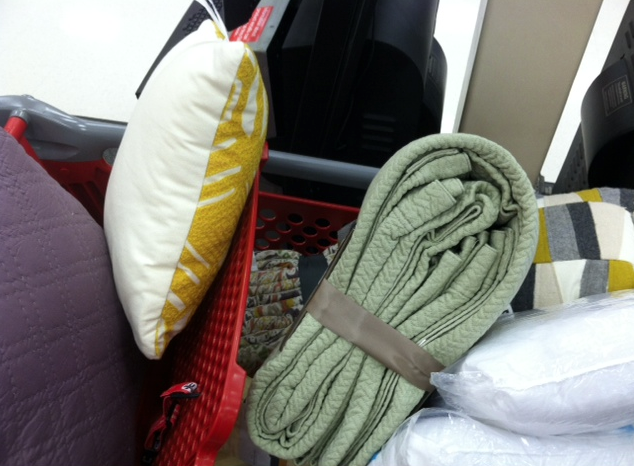 I picked out a fabulous selection of new bedding and went to the check out where just seconds before the check-out lady started ringing me up I realized I didn’t bring my wallet. I quickly loaded it all back up in the cart and asked the customer service gal if I could save the cart for a bit because I, you know, forgot my wallet. I wondered how often people park carts over there and never go back and as I left I wondered if I should be one of those people. But I really liked the new bedding and I remembered my 3-point plan from above, so I drove home, got my wallet, and then went back. I like to do everything twice. Later on evening I headed to Home Depot armed with the quilt from my stash. After deliberating for 15 minutes with Chloe over which of the 7 shades of yellow I held in my hand was THE shade, I walked out with 3 cans of Jackfruit from Behr. I’ve only done one closet so far, but I can already tell – this is one really good decision. I’m impressed it only took you 15 minutes to pick out the paint! I would be there for an hour, and then take home 18 swatches and tape them to the wall, and then ask for multiple opinions, and then debate some more, and then question if it’s going to dry darker and be *too* dark, and then go back to the store and find another shade of that color that I didn’t have in my original stash, and finally…a month later…have my paint! Ugh.